RIYADH, Saudi Arabia -- The Saudi-led coalition fighting Yemen's Shiite rebels said it intercepted a missile fired over southern Riyadh on Tuesday, which the rebels said was targeting the royal palace in the kingdom's capital. The Yemeni rebels said they launched a ballistic missile to target Yamama Palace in Riyadh, where King Salman chairs weekly government meetings and receives dignitaries and heads of state from around the world. Nikki Haley, the U.S. Ambassador to the United Nations, last week introduced what she said was irrefutable evidence that Iran has violated U.N rules by providing the Houthi rebels with arms. 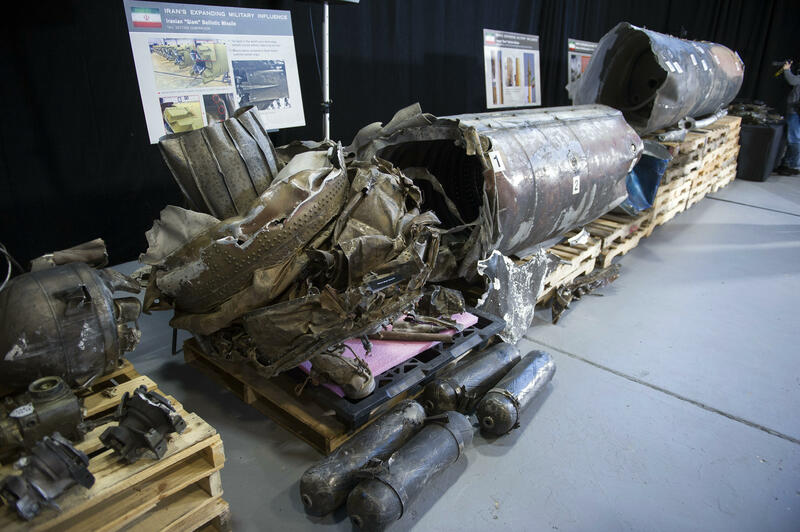 At a press conference at the Joint Base Anacostia-Bolling in Washington, D.C., Haley presented what she described as recovered pieces of a missile fired by Houthi militants from Yemen into Saudi Arabia in a Nov. 4 attack, pointing out the missile bears "Iranian missile fingerprints." Haley spoke specifically to the attack on the Saudi airport in Riyadh. That missile was fired by Houthi rebels from Yemen into Saudi. She asked people to imagine if the missile was launched at a major U.S. airport, such as JFK or Dulles, or at international targets in London or Paris. "It's hard to find a conflict or a terrorist group in the Middle East that does not have Iran's fingerprints all over it," Haley said Thursday. She pointed to a new U.N. report, obtained by CBS News, by U.N. Secretary General Antonio Guterres that warns Iran may be defying a Security Council call to halt ballistic missile development even as it complies with the nuclear deal with six world powers, reports CBS News' Pamela Falk from the U.N.
Saudi Arabia has the U.S.-made Patriot surface-to-air anti-missile system, which President Donald Trump credited for bringing the Nov. 4 missile down. In the almost three years that the Saudi-led coalition has waged war with Yemen's rebels, dozens of other missiles have been fired by the Houthis across the border into Saudi Arabia, reaching as far as some border towns. There have been casualties among local residents in those attacks. Earlier this month, the Houthis claimed they fired a missile at an under-construction nuclear plant in the United Arab Emirates, which is part of the Saudi coalition. The UAE, however, denied that a missile had been fired. The Saudi-led coalition has been at war with the Houthis since March 2015. The Houthis, who are allied with Saudi Arabia's rival, Iran, have forced into exile the Saudi-backed and internationally recognized government of President Abed Rabbo Mansour Hadi. Despite a fierce air campaign against the Houthis, the rebels still control the Yemeni capital, Sanaa, and much of the country's north along the border with Saudi Arabia. Earlier this month, the Houthis killed Yemen's former president, Ali Abdullah Saleh, after he broke off his alliance with them and appeared ready to switch sides. Yemen's war has killed more than 10,000 civilians and driven millions to the brink of famine.